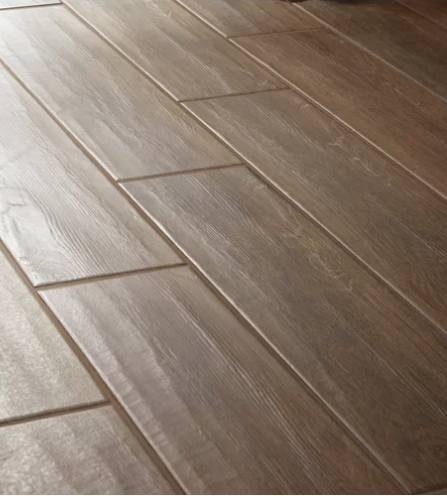 Light-colored, wood-look ceramic tiles are a practical choice for basements, which can be prone to moisture. 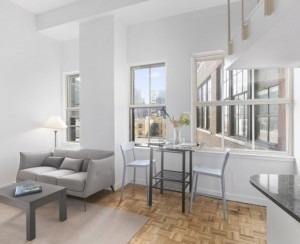 Hardwood is the material of choice in NYC and while flooring and other manufacturers have been offering imitations for years, recent advances in inkjet and digital printing have resulted in some great pretenders. 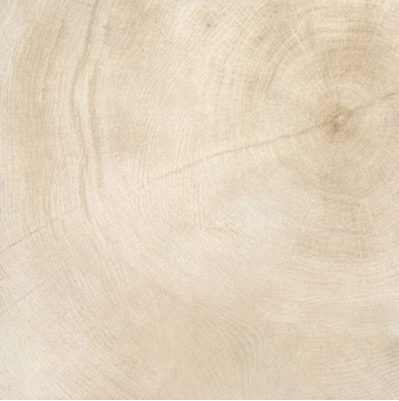 You can get ceramic tiles with grain and texture that will give you the look and feel of wood with more durability. One interior designer gives credit to Joanna Gaines of "Fixer Upper" on HGTV who highlighted a rustic wood paneling called shiplap, for sparking interest in viewers who wanted an easy way to replicate the look. Wood-look ceramic tile is "fun and playful, and you can get it at a wide array of price points. 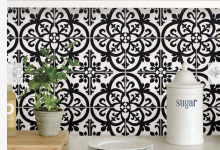 It’s now very ubiquitous from Home Depot to a high-end tile shop,” says Betsy Helmuth, owner of Affordable Interior Design. 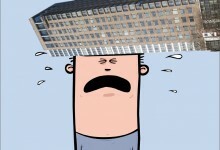 That might explain why you are seeing it popping up in listing photos for NYC apartments. “It is great in a place where you can’t use wood, like a basement or a beach house, somewhere that gets a lot of humidity or a lot of wear, or where the moisture might impact real wood,” says Helmuth. 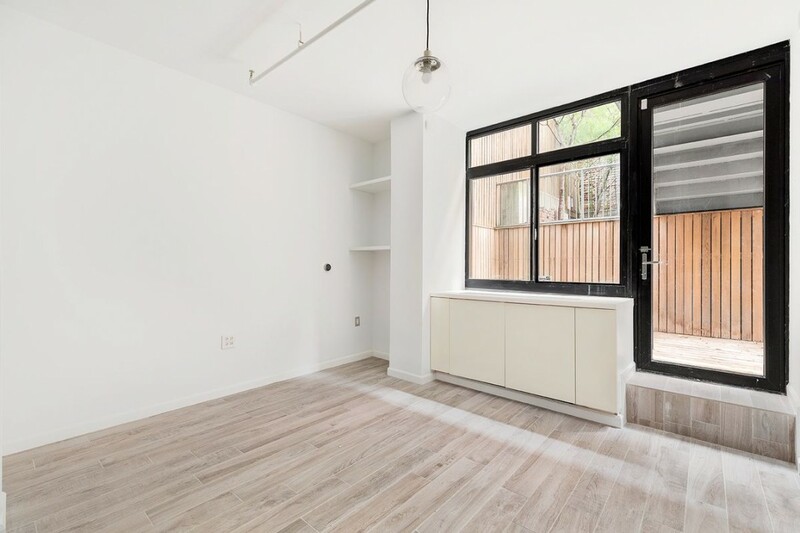 The remodeled basement of a Chinatown duplex (pictured above) is one example. It can work in a bathroom if it doesn't bump up against real wood. Another application is for a bathroom, though Helmuth warns against having the wood-look tile too close to real wood flooring. 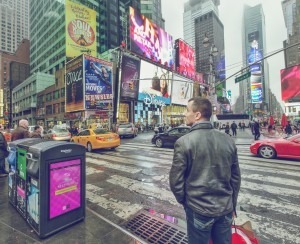 “I don’t like the juxtaposition of the real with the fake. In my mind, it is one or the other,” she says. 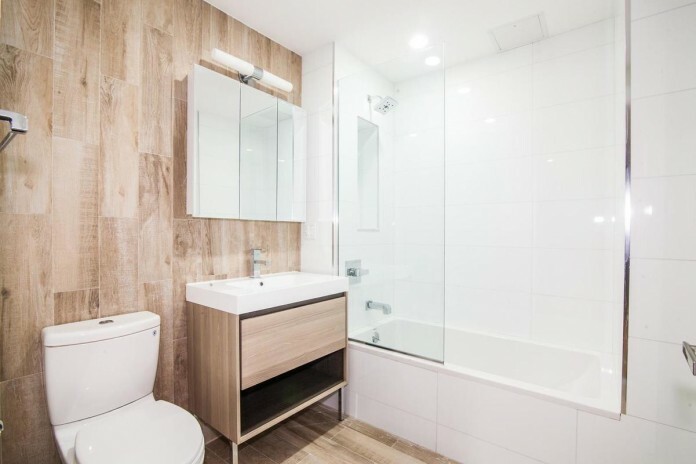 The tile looks very convincing in listing photos but in person, it’s clearly not wood. While Helmuth says that’s not something that should put buyers off, mixing the two will highlight the difference. 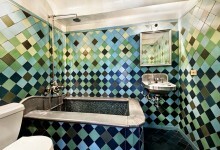 “It does look like tile, you can see the grout lines between the pieces, which is very unlike real wood. On its own, it can be lovely and it can be a really nice statement," she says. If you're looking for a classic, Helmuth suggests you're better off with a marble-hex tile or subway tiles but it can be a fun spin on wood and it's practical if there's any risk of moisture damage. Below, six wood-look tiles for your next interior design project. 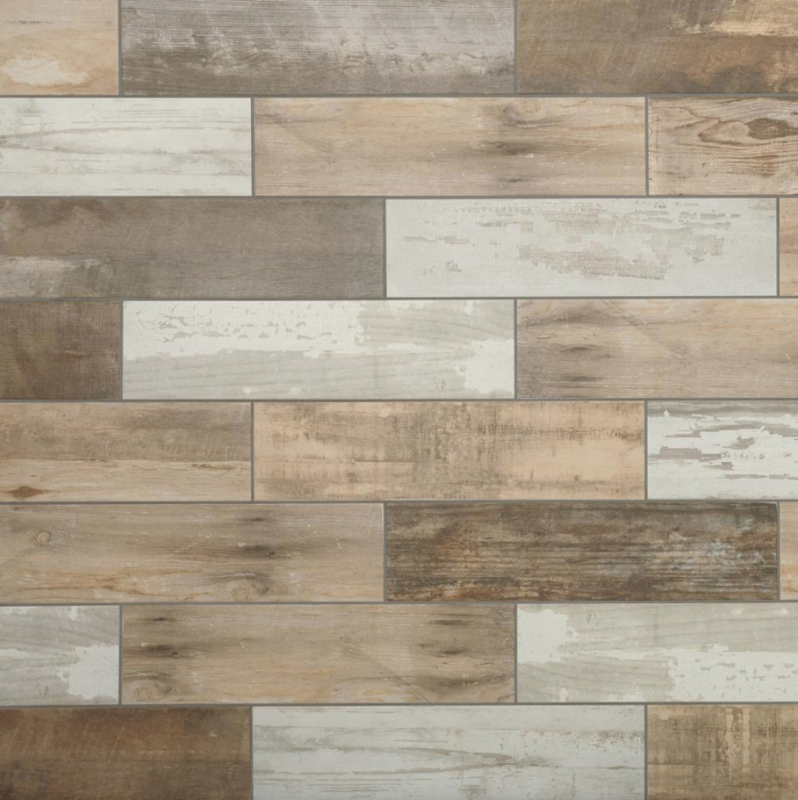 This tile is available in planks of various sizes and colors as well as mosaic sheets, like this one in beige and brown. 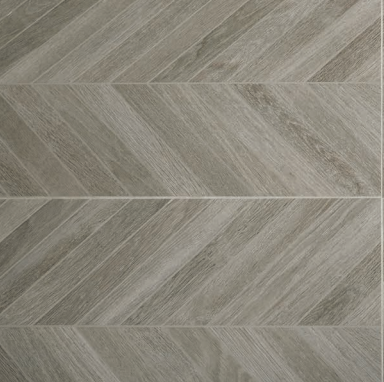 A take on traditional oak, this tile is available as planks, lattice weave or as a herringbone accent in a range of colors. 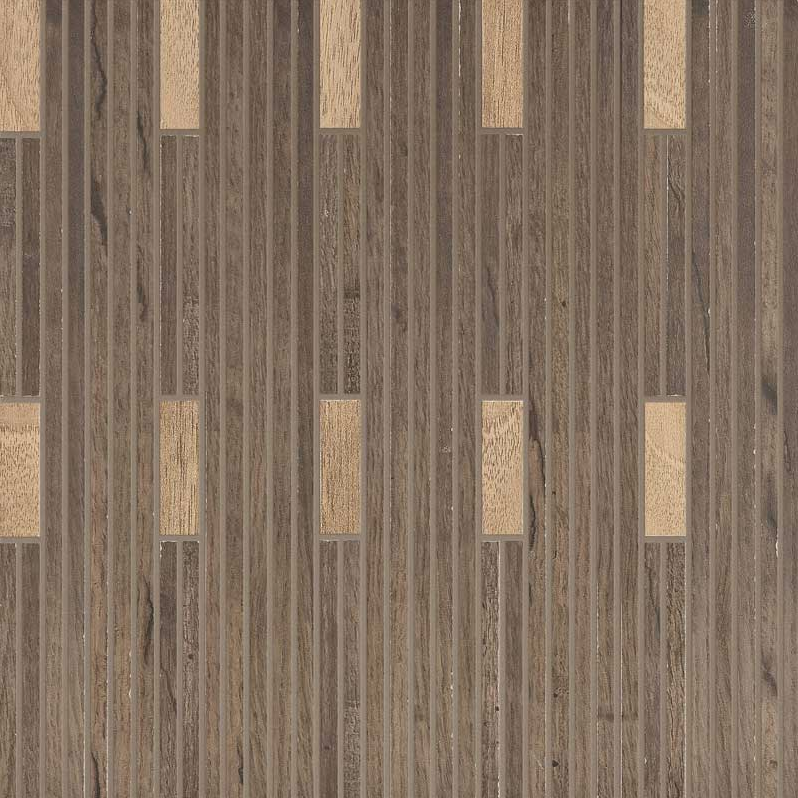 This porcelain tile has a low sheen and comes in 6-inch-by-36-inch planks, suitable for walls and floors. These 6-inch-by-24-inch tiles mock the cross cut grain of wood for a different effect and come in a range of colors—this one is marrow. A dark brown faux wood designed and manufactured in the U.S. and suitable for flooring indoors and out. Planks are 6 inch by 24 inch. 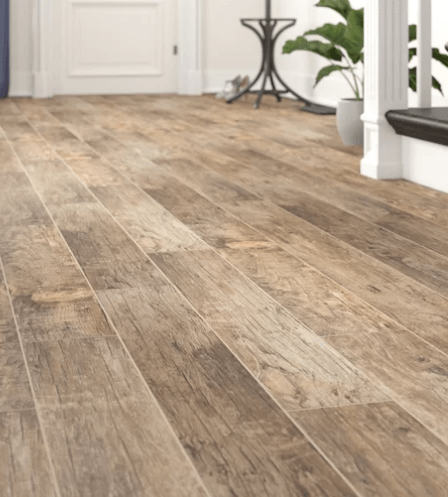 Scratch resistant and suitable for walls and floors, these tiles come in planks that are 6 inch by 24 inch and create a mismatched, shabby-chic look.